Sanatan Dharma has been considered the oldest and the greatest dharma of the world. Scriptures of the Sanatan Dharma teaches us how to live a good life, and how can we live happily in grahastha-ashram. World's oldest scripture is 'Rigveda'. Sages and highly intellectual people of our faith have written books on each richa and mantra of Rigveda and other vedas. 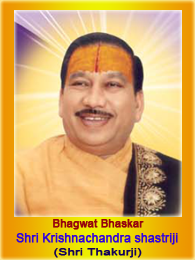 Shri Krishna Dwapayan Maharishi Ved-vyasji is counted in twenty four avatars of bhagwan Shri Vishnu. Ved-vyasji has written books on vedic philosophy. Shri Ved-vyasji wrote Shrimad Bhagavatam Mahapuranam which has been considered the best puran among all other scriptures written by other sages on vedic philosophy. Means, vedas are also called Nigam and Shrimad Bhagavatam is the ripen fruit of vedic kalpa-vraksha. This fruit has no skin and seed, it has just the flash which is full of rasa and only rasa. Shri Shukadev swamiji, the son of Shri Ved-vyasji made this rasa even more rasamaya. After getting the touch of Shri Shukadev swami, Shrimad Bhagavatam became even better. It is full of moksha-rupi nectar, thus, we shall drink this nectar using our ears. Bhakti, Gyan, and Karma all three has been described in Shrimad Bhagavatam in detail. Means, a jeev takes birth (physical form) because of his Karma only. It is also said that Karma is Pooja (worship). Man shall be karmayogi or dedicated to karma. We can achieve anything by doing karma. One more thing is also mentioned in Shrimad Bhagavatam with great attention that fate is not a thing of dreams, actually karma become fate. Today's satkarm will bring happiness in future, and today's bad karma will bring sorrow in future. So, by doing karma a person can change his fortune. If we analyze this in more detail then we will find that karma is the seed and fortune is the fruit. There is no tree without the seed, and there is no fruit without the tree. So we shall do our work with dedication. We shall do good karma to get good results, and the same karma will become fortune one day. We can change our palm lines and forehead lines with our Karma. We can bring numerous changes in our life with our Karma. A person's true karma can get him the designation of Indra, the king of devatas. So we must do karma, and it is also considered that karma is everything. Scriptures say that an entrepreneur, hard working person, and karmayogi can achieve anything in his life. Those people who say that fate is everything and don't do anything are called coward, and lazy. So, we must put fate aside and do karma with dedication. If we don't get good results then we may say that the karma was not done in a right way with truthfulness. One who does not see Parmatma in everyone, cannot find the God in temple either. One who sees Parmatma in everyone can only find Bhagwan in the temple. Keeping this faith and relationship with Bhagwan alive, and doing karma with the samarpan bhav is also Bhakti-yoga. Aatma is never born, and never dies, it has no bad characteristic like sorrow, anger, pride etc. ; and we are that Aatma. We are not this material body, but that divine and eternal living Atma. This knowledge is called Gyan. What is our relationship to Parmatma? We are the children of Parmatma. Parmatma has created us and has given us all types of powers and abilities. The complete knowledge of this fact is called Gyan. Knowing who I am, and knowing what Parmatma is, and knowing who is sitting inside the other person or thing, and then thinking about all these three aspects and realizing that a single Parmatma is sitting in all of us is called Gyan-yoga. For example, if you fill up water in fifty open containers and put them in an open area, you will feel that there are fifty suns in the sky and each of them is visible in each of the containers. However, there is only one sun in the sky and the same is reflecting in each of the containers. Similarly, all the bodies are like containers that are full of karma(in the form of water), and it is Parmatma whose reflection is visible in all the bodies. Thus, all the jeevs are one, all the living beings are one, and we shall not see any difference in different personalities. We shall not think that he is small and he is big, we must not carry any bad feeling or jealousy for anyone. We must have love for everyone in our heart, and shall treat everyone equally. I see Parmatma in everyone and Parmatma is present in this whole universe. Believing this principle and having respect for everyone is also called Gyan. means, that one who listens to and reads Shrimad Bhagavatam obtains Moksha. One more thing to understand is, what is Moksha? Moksha is not death, moksha is not getting rid of this material body; the complete destruction of moha is called Moksha. Considering yourself as a part or whole body is one type of moha. If we attain this knowledge that we are eternal, sacred, free, and living Atma then even while living this life span we are jivan-mukta otherwise we don't get mukti even after the destruction of this material body. Shrimad Bhagavatam is the summary of all the vedas, upnishads, and shastras; that is why it is said that we must listen to, and read Shrimad Bhagawatam. By mere listening to Shrimad Bhagavatam; that nirgun, nirvikar, and nirvishesh Parmatma sitting in the heart of a bhakta takes the physical form and appears in front of the bhakta. Shrimad Bhagavatam makes the life eternal. People from all the corners of this world are getting attracted toward Shrimad Bhagavatam. Curious and qualified people from all over the world including developed countries like to understand and listen to Shrimad Bhagavatam. We must listen to, and read Shrimad Bhagawat katha to carry our life toward the light of eternal knowledge. This is the message of Shrimad Bhagavatam in short.